Ligeti nasty – Barber nice: that seems to be the concept of this album. The idea of pairing Ligeti’s works with romantic favorites has been growing in popularity in recent years. In last year’s Proms, I heard a concert by the Berlin Philharmonic conducted by Simon Rattle in which Atmosphères segued directly into the Prelude to Lohengrin. And going back to 2008, I heard the London Philharmonic begin a concert the same way, but that time the Ligeti was played attacca with The Rite of Spring. By comparison with Ligeti’s uncompromising sonorism, even the Stravinsky sounded like a throwback to the 19th century. As with both of those concerts, the idea here seems to be one of radical juxtaposition. Paul Griffiths is given the thankless task of justifying the programming in the liner note. He argues that we live in eclectic times and that all music belongs to the ‘world of performance,’ before going on to find specific connections between the works, most pertinently the idea of lament, which the two composers approach in their own different ways. It is significant that programming Ligeti’s music in this way has only become popular since he died, and it is hard to imagine the composer himself approving of the pigeonholing that it encourages. In all three of these cases, Ligeti’s music sounds as if it has been co-opted, and the effects of the program can be felt in the way the music is played as much as in the connotations that its context suggests. When Rattle set Atmosphères against the Lohengrin Prelude, the intended narrative was of a path from complexity to simplicity, or from darkness to light. This required a reading of the Ligeti that was complex and dark and a reading of the Wagner that was simple and light. That is a very reductive way to treat either work, and both were simplified through this process of aesthetic polarization. The Keller Quartet’s approach is similarly reductive, although perhaps a little less so, as the players are not so intent on emphasizing contrasts between the two composers’ works. In fact, some of the calmer “metamorphoses” in Ligeti’s First Quartet are played in a lyrical, emotive way, as if to highlight the expressive connections with the Barber to follow. And the Barber is given an unusually unsentimental reading, a little faster than most accounts and with significant restraint in terms of rubato. Ligeti’s music for string quartet is well served by commercial recordings. The La Salle Quartet, to whom the Second Quartet is dedicated, recorded both numbered string quartets in a version that is still available from Deutsche Grammophon (028947432722). The Arditti Quartet has recorded the two string quartets twice, the first time in 1988 for Wergo (WER 60079-50), and then in 1994 for the first volume of the Sony (later Teldec) Ligeti Edition (SK 62306). Since then, many young quartets have sought to prove themselves by recording these indisputably virtuosic works, and the recordings by the Artemis, Parker, and JACK Quartets have all received warm, if not always ecstatic, reviews (the Artemis from Robert Carl in 29:5, the Parker from Raymond Tuttle in 33:5). As both of those reviewers rightly state, the benchmark recording is undoubtedly the second Arditti version, and in comparison to that, this new version from the Keller Quartet is found wanting in several significant respects. The warm ECM sound helps give some of the quieter passages some atmosphere, especially at the beginning and in some of the other early passages in the First Quartet. But there is a lot of violence in this music, and both the performers and the engineers smooth over too many of the edges. Even in the First Quartet, there are passages of searing, ugly dissonance, and the Second Quartet a whole movement—the fourth—is given over to this kind of music. The Ardittis don’t hold back, and the sheer intensity of their playing in these passages highlights the undue reserve that the Kellers bring. The Ardittis also inject the music with a sense of urgency and purpose that often seems lacking here. The “meccanismo” third movement of the Second Quartet, for example, is not aggressive as such, but needs a real sense of momentum. The Kellers take half a minute longer than the Ardittis (a significant difference given that the Ardittis play the movement in three minutes), but even at the faster pace the Ardittis present the music with clearer and more lucid textures. The ending of the First Quartet is a similar case: The three upper parts play glissando artificial harmonics over a cello solo. In the Arditti recording, you can clearly hear every one of the harmonics, from the Kellers all you get is an indistinct scraping sound. The one movement that the Kellers are able to excel at though is the last of the Second Quartet. The music here is all about sudden, erratic ideas, including fast chromatic runs, appearing out of very quiet held drones. The combination of the warm sound and the players’ controlled, even tone brings the contrasts here to life. The ending of the work is clearly intended to be sudden and unexpected, and this recording really gives that impression, even if you know it is coming. Given the enduring supremacy of the Arditti’s second recording of Ligeti’s string quartets, the only realistic competition these days is for second place. The Keller Quartet may well be a contender here, especially as the interpretation they present is so distinctive. 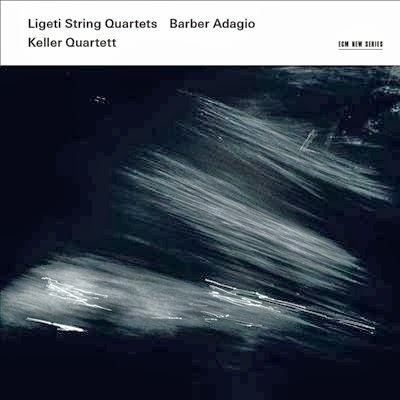 Finding common ground between Ligeti’s quartets and Barber’s Adagio is one thing, but a much more complex issue is the problem of reconciling Ligeti’s often angular and aggressive aesthetic with the warm, ambient sound favored by ECM. This recording shows that it is possible, and that the music has different things to say when presented in this way. As the Ligeti quartets gradually assume their rightful place at the heart of the chamber music repertoire, it is heartening to find that the range of valid and complementary interpretive approaches that can be heard on disc is growing all the time.